When you get a second-hand computer from a friend, buy a name brand computer from a big box retailer, or you are looking to “refresh” one of your devices, you may be thinking about removing bloatware from its hard drive. Instead of doing a complete wipe of the hard drive, which would wipe vital information, removing bloatware can help get rid of all the unnecessary files and programs that are slowing down the machine. 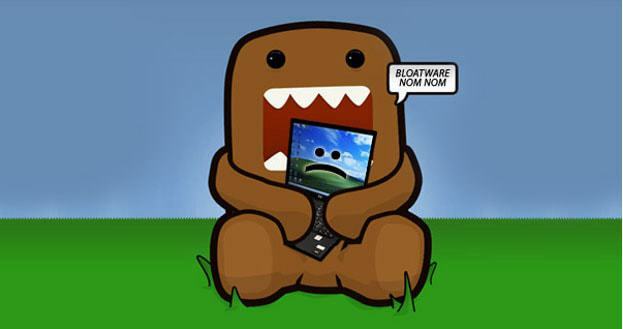 Here is a three-step process for getting rid of bloatware. Programs such as PC Decrapifier are very useful when you are attempting to get rid of bloatware. It will give you a list of “bloatware” programs and files, and allow you to uninstall them with only a few clicks. Sometimes these programs don’t remove all bloatware, but it’s a good start. The simplest way to uninstall programs is to do them manually. Go to your Control Panel and find the Uninstall Programs icon. You can select any program and remove it from your device. This process can take a bit of time, but you will get all these programs removed from your computer eventually. Be careful what you install though… you may find yourself uninstalling something you might need later, so give us a call if you’re not sure! Sometimes bloatware does not take the shape of a program that is automatically registered by the computer. In these cases, the program uninstall option may not be present in your Control Panel. And there are also massive files that you may not need on the computer. For these issues, use a program such as TreeSize, which allows you to see what folders in your hard drive are taking up the most space. You can assess each folder and file individually, and decide what merits removal. When you are going through this process, ensure you do not delete any program or file that is vital to the running of Windows. If you are unsure about a file, give us a call and we’ll give you a little advice. Even better, bring it to us for a full “debloat” and an onverall tune-up. Bloatware can be one of a number of reasons your computer is running slow. Let us know if you need help! Previous Post Get the Most out of your Computer: Speed up your PC!